The Keeter Center at College of the Ozarks is the perfect spot to celebrate Father’s Day in Branson. 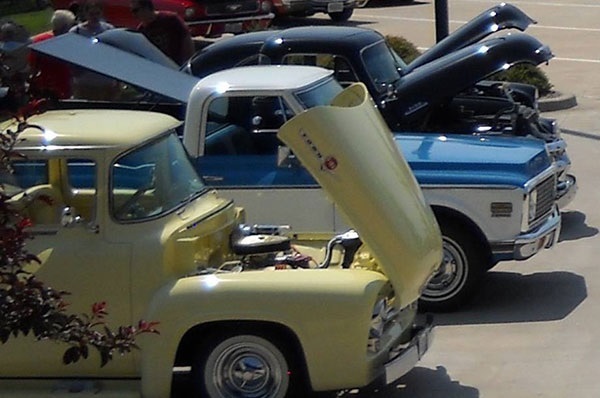 Aside from treating your father to a nice Father’s Day Brunch, The Keeter Center will also host a Car Show where you can witness custom and classic car. On June 18, 2017, don’t miss to treat your father to a trip to Branson and spend a Sunday Brunch with the whole family. There are special events that await for those who want to celebrate Father’s day in Branson. Father’s Day Weekend Shopping Sales can be enjoyed also at some Branson’s outlet malls such as Tanger Outlet Center, Branson Craft Mall, and a lot more at the Historic Downtown Branson. A popular mall off the coast of Lake Taneycomo, Branson Landing will be holding a Father’s Day Weekend starting June 17, Saturday. In this shopper’s paradise, you don’t only enjoy shopping, you can also have some quality time with your dad with some exciting activities. Lake Taneycomo is one of the lakes in Missouri with record holder trout and bass. If you are one of the fishing enthusiasts visiting the area, you might just be the next one to capture a record breaking fish here. As you help celebrate Father’s Day Brunch with the whole family in the elegant Keeter Center, you will feast on the beautiful landscape around the College of the Ozarks campus while enjoying classic car show. The Keeter Center offers a variety of presentations including the Farmhouse with personalized omelets and waffles. The Marketplace will feature the Chef’s beautiful ice sculpture, hand-cut fresh season fruits, crudités, local and imported cheese, and made-to-order Caesar salads. The Chef’s Table is abundant with culinary delights such as seafood creations, and carved award-winning College of the Ozarks smoked ham. The Father’s Day Brunch offered at the Keeter Center is always delectable, with personalized waffles, homemade fare like cornmeal-breaded catfish and barbecued pork ribs, a cheese selection, perfect desserts and more. The center has a special menu which features roast prime rib and smoked ham alongside delicious traditional accompaniments. Stick around after the brunch and check out the car show that takes place on the same day. The Titanic Museum is also a great place to celebrate Father’s day in Branson. The museum is holding a Father’s Day Boat Show for its guests. Aside from the fun that you can enjoy at the world’s biggest museum, dads will also have a wonderful time in the museum as they witness vintage and modern boats in the parking lot of the Titanic Museum. If you want to enjoy more fun and adventure in Branson, the best place to go is Silver Dollar City. From its world-class rides and exciting shows, the amusement park is sure to be a special Father’s celebration for your dad. On June 18, why not treat your father to a nice Father’s Day Brunch and Car Show at The Keeter Center at College of the Ozarks in Branson.